Practical Applied Hermetics shows a mural with black paint or ink on the wall; a trompe ‘l oeil of a rather mysterious and claustrophobic living room. In the center it shows an open window. 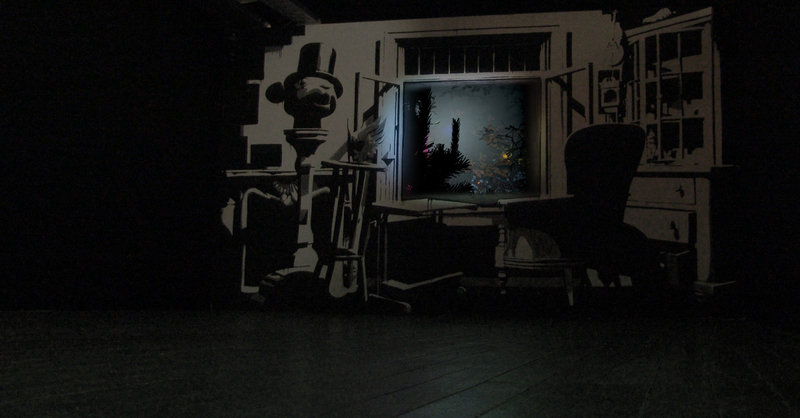 Inside the window, on it’s black reflective surface, an animationloop is projected. The film shows a continuous forward camera-movement through a (virtual) forest. A soundtrack by Belgian musician Tim Vanhamel accompanies the film and adds hypnotism to the animation. The only light, apart from the projection, comes from a safe-light which is placed in accordance with the painted shadows of the mural. The combination of the movement within the animation and the suggestion of 3D-objects in the mural gives the viewer a sense of being in a moving, furnished room. 2010 – 2011 Hareng Saur, Ensor and Contemporary Art, SMAK, Ghent. With, a.o. Eija-Liisa Ahtila, Francis Alys, Huma Bhabha, Jake en Dinos Chapman, George Condo, Thierry De Cordier, Marlene Dumas, Thomas Hirschhorn, Yang Jiechang, Tomasz Kowalski, Jonathan Meese, Bruce Nauman, Ugo Rondinone, Dana Schutz, Cindy Sherman, Raymond Pettibon, Thomas Schütte, Jan Vercruysse, en Thomas Zipp, Guillaume Bijl, Anne-Mie van Kerckhoven. The final version of the animation loop, as shown in the installation at ‘Visions Fugitives’, Le Fresnoy, Tourcoing, Fr.